Yes, Roman Catholicism did give us the Sistine Chapel, Paradise Lost, Ulysses, the Divine Comedy, and Lord of the Rings. And it’s true that Orthodoxy gave us iconography and Dostoevsky. 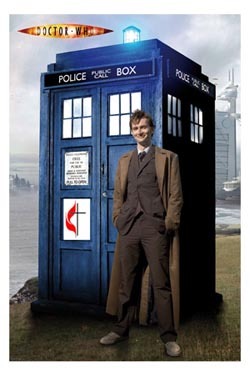 But, you can thank those of us in the United Methodist Church for Doctor Who. That’s right, if you are a Dr. Who viewer, you may have noticed our ads while watching “Blink” on Friday night. Apparently, the minds, hearts, and doors of my church are so open they will even take Dr. Who fans, who have, outside of cons and annual PBS fundraising telethons, traditionally remained social pariahs. So whenever you hear the wheezing-and-grinding sound of the TARDIS, you can thank a Methodist. Saturday, between haircuts and his first soccer game of the season, my son and I visited Spirit Halloween. After I led him through a decked-out foyer into the store, he found his costume for the season. He also found a costume for me: a vampire. Not wanting to fork out the twenty-five to fifty dollars for a vampire costume for myself when I knew we would already be spending a fortune on Halloween, I told him that they didn’t have one in my size. Eager for me to get the costume, he pointed one out and said, “But, they do vampire costumes for fat dads. See.” I guess it’s time for me to end my break from exercise. 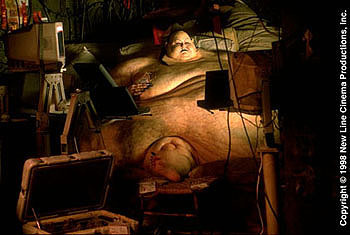 Otherwise, I’ll be going trick-or-treating as Pearl from Blade. Review: Milne, A. A. The Complete Tales & Poems of Winnie-the-Pooh. New York: Dutton Children’s Books, 2001. A. A. Milne’s The Complete Tales & Poems of Winnie-the-Pooh is a delight for children and an even greater delight for the adult that shares it with them. At a time in which children are bombarded with salvo after salvo of Mouthy Morphin’ Power Rangers, Tortoise Assassins, Happy Scrappy Hero Pups, Pokechus, and Pikamons, it’s great to be granted asylum with Christopher Robin, Pooh, Piglet, Tigger, Eeyore, Owl, Kanga, Roo, and Rabbit (and all his friends and relations) in the Hundred Acre Woods. While the poetry collections “When We Were Very Young” and “Now We Are Six” received only a lukewarm reception, all of the Pooh tales received the attention, smiles, and laughter they so justly deserved. Milne’s writing style and Ernest H. Shepard’s warm “Classic Pooh” illustrations made the reading of this book was more of a parental treat than a parental duty. Recommended for ages five through wheneverish. Warning: Cherished memories will ensue. Review: Meier, Andrew. Chechnya: To The Heart of A Conflict. New York: W. W. Norton & Company, 2005. Andrew Meier’s Chechnya: To The Heart of A Conflict consists several chapters drawn from his larger work: Black Earth: A Journey Through Russia After The Fall. In it, Meier, a veteran war correspondent, recounts his tour of Chechnya and his encounters with the forces that have torn the land apart and those few individuals who have struggled valiantly to heal the land. I confess. I, like much of America, felt compelled to watch the trainwreck known as Britney Spears “comeback” performance opening the 2007 MTV Video Music Awards. Aside from Britney’s lip-synching, a “talent” she apparently developed by aping old Chopsocky flicks, her performance looked like something young army privates can watch any night of the week at any one of a dozen establishments on Victory Drive for the price of a few greenbacks tucked between cellulite and an overly-stretched thong. A question that I and, I’m certain, most of my fellow viewers echoed when the performance was over. Readers may remember my delight at finding a cache of the re-issued G.I. Joes with Kung Fu Grip at my local Wal-Mart. Well, apparently I’m not the only one suffering from Joemania. Fox News has reported that G.I. Joe, the movie, is set for release in the summer of ’09, but the big news is that Joe will be de-Americanized. Whoever, penned said article for Fox don’t know Joe like I know Joe. For one thing, Fox states that “no longer will G.I. Joe be a U.S. Special Forces soldier.” For Fox’s information, Joe wasn’t a Special Forces soldier until 1966 or so. And, even then, you had to buy the Special Forces Joe sold only at Sears, I believe it was. Most Joes were either Action Soldiers, Action Sailors, Action Pilots, or Action Marines. While the idea of G.I. Joe being part of an organization with a name as cheesy and contrived as “Global Integrated Joint Operating Entity” (per the new movie) is pretty lame, nothing is as lame as being an “Ecowarrior.” Just look at Al Gore. However, I do find that “the ironing is delicious” when I consider that many of those who seem to have no qualms with turning our real-life G.I.s into some sort of global SWAT team are the first to start ranting when Hollywood wants to make a movie re-interpreting America’s movable fighting man fic-tion-al char-act-er as a global movable fighting man fic-tion-al char-act-er. Many G.I. Jingoists are threatening to boycott the movie based upon this change. I probably won’t see the movie either, but it won’t be because Joe’s gone global. It’s because this isn’t my Joe. It more closely resembles the Joe of the eighties. G.I. Joe is now a Brussels-based outfit that stands for Global Integrated Joint Operating Entity, an international co-ed force of operatives who use hi-tech equipment to battle Cobra, an evil organization headed by a double-crossing Scottish arms dealer. The property is closer in tone to “X-Men” and James Bond than a war film. American or not, that doesn’t sound like the G.I. Joe I grew up with. Although, my first Joe announced that he was “G.I. Joe, U.S. Army, re-porting for duty,” most of my Joes were members of the Adventure Team. They weren’t based in Brussels, but they weren’t based at Benning either. They were headquartered at Adventure Team Training Center. They didn’t battle commies or Cobra. They battled white tigers, abominable snowmen, and pygmy gorillas. And while his adventures were sometimes close in tone to James Bond, they were more like those of Dirk Pitt, Karen Ross, Connor Ford, and Ed Tully than those of Cyclops or Rambo. I remember getting the G.I. Joe footlocker at Grant’s department store when I was a kid. We bought one for my friend for his birthday, and, being the spoiled brat that I was, I simply had to have one for myself as well. After all, I considered my G.I. Joes my troops, and, according to the old military leadership axiom, you have to take care of the troops, right? I bring this up because I got quite a laugh out of Christian T.V. comedy show host Thor Ramsey’s reminiscences about his own “G.I. Joe footlocker,” the white one that his mother gave him. Meanwhile, Geekdad @ Wired poses a problem to its readership: How to let G.I. Joe paratroopers get in some High Altitude jumps. Figures of Fortune proposes one elaborate solution. Putin, Vladimir. First Person: An Astonishingly Frank Self-Portrait by Russia’s President. 2000. New York: Public Affairs, 2000. First Person is more of a collection of interviews than a traditional autobiography. The questions cover everything from the television watching habits of Russia’s First Family to the chain of events that led to Putin’s being slotted as Yeltsin’s successor. While the whole thing reads like a “Vote for Putin” campaign brochure, there are times when the interviewers get very frank and candid, so much so that the reader is surprised that President Putin didn’t break out some of that old-time KGB “justice” on them. Overall, it was an enjoyable read.